We’re getting closer to basketball as Rockets announce their slate of games for the 2016-17 NBA season. We’re smack dab in the middle of the NBA’s dead period, but we got a little tease on Thursday as the league released their 2016-17 game schedule. The Houston Rockets, armed with new shooters in Ryan Anderson and Eric Gordon to play alongside James Harden, will open the season on the road as they face the team Mike D’Antoni’s previously coached, taking on the Lakers in Los Angeles on October 26th. The Rockets follow that up with an away-home doubleheader against the Dallas Mavericks. It’s a fairly tough start for the Rockets as seven of their first eight games are on the road, including road matchups with the Cavaliers and Spurs. Dwight Howard makes his return to Houston on February 2nd when the Atlanta Hawks come to town, though it won’t be the first time he faces his former team. The Rockets-Hawks square off in Atlanta on November 5th. The Golden State Warriors were already a hot ticket but it’s clearly the show to see now with Kevin Durant joining Stephen Curry and Klay Thompson. The Warriors will play at Toyota Center on January 20th and March 28th. Anderson and Gordon will make their return to New Orleans on February 23rd when the Rockets take on the Pelicans. Holiday game dates? The Rockets had played on Christmas Day in three of the previous four seasons but it will not happen this season. They will play on New Year’s Eve at home however, taking on the Knicks. 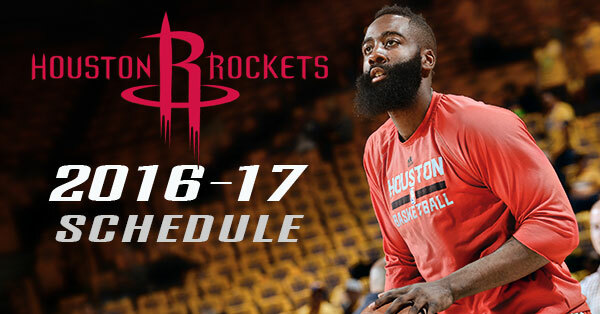 You can see the full Houston Rockets 2016-17 schedule at Rockets.com here.